Don Draper and the rest of the Mad Men cast have built an empire on ’60s nostalgia. In 2009, the website AskMen produced a list of the world’s 49 most influential men. Above Olympian Usain Bolt, above Facebook founder Mark Zuckerberg — above even Barack Obama — the men of the Internet chose Don Draper. A television character. But no mere television character. Don Draper is a brilliant, excellent-looking serial adulterer with a dark past, an artist’s soul and the jaw line of John Hamm. He is an iconic character who has become more so during the show’s 17-month hiatus, which ended with Sunday’s Season Five premiere. Don Draper disappeared and Banana Republic created a clothing line in his honor. 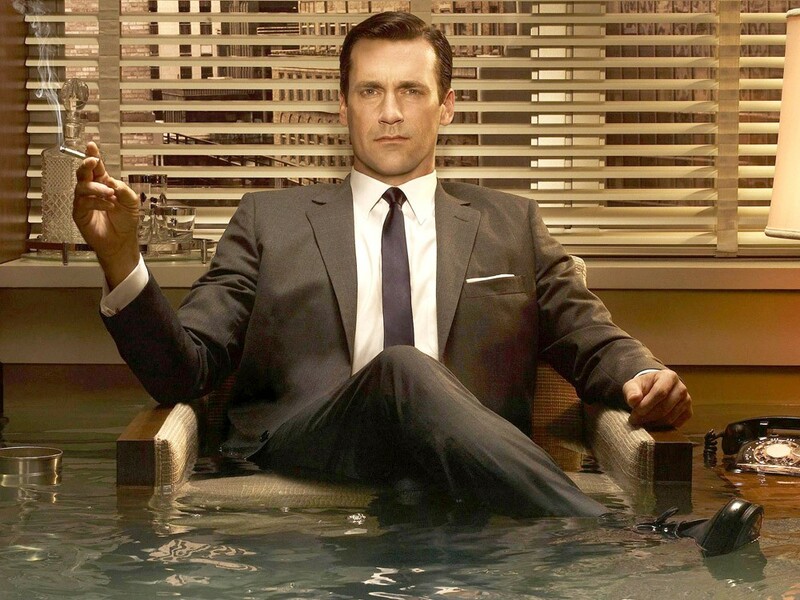 To say almost everyone loves Mad Men is to make no grand claim. The hour-long drama about a Madison Avenue advertising firm has won the Best Drama Emmy every year of its existence and propelled its network, AMC, from also-ran to the vanguard of serial television. Audiences love it. Critics love it. Academics love it. Feminists love it. But some of these same local academics find the show’s pitch-perfect recreation of the ’60s to be problematic. While the show is perhaps the most compelling piece of social criticism on television, some worry that it recreates the era so well, and is so beautifully shot, that people often see the image and miss the message. Ann Ciasullo, another English professor at Gonzaga, says you can tell the media is missing the point when a show that revolves around incredibly unhappy marriages inspires articles in magazines with headlines like, “How to Mad Men your Wedding.” A story in last Saturday’s Spokesman went on at length about the women’s fashion of the decade, with scarcely a word about women’s struggles during that time (there was one throwaway reference to “bra burning”). Heather Gasser directs the Women’s Center at the University of Idaho. Every Monday at lunch, the center screens an episode of Mad Men and then hosts a discussion of the show’s themes and conflicts. The audience for these discussions isn’t large, but there’s a diverse range of ages, sexes and sexual orientations. The general consensus here is that people who idealize the ’60s tend to be too young to have lived through it. People who were the age of Don Draper’s daughter in the show in the mid ’60s — growing up pouring their daddies drinks after a hard day at work and who are now middle-age — see past the glamour more easily. Talk turns to masculinity and marriage. All of the Mad Men firm’s most successful men are the worst to their wives. They marry trophies and then ensconce them in the suburbs while they drink and carouse in the city. Gasser notes that one of the best husbands — someone who actually listens to his wife and seems to care for her — is a closeted gay man. “Salvatore is one of the few people who is kind to his wife and considerate,” she says. Gonzaga’s Jessica Maucione, who wrote a paper on the show’s “racial erasures,” says this is her main problem with Mad Men. The white male and female characters are written with nuance and care, while the minority characters — especially black people — are flat and thin. In Season Two, a white copywriter named Paul Kinsey dates a black woman named Sheila White, going with her on freedom rides to the South. Maucione says that, while we are given an extended peek into the troubles of white women like Peggy, Sheila White scarcely says a word, effectively turning her character into window dressing for a liberal white man. On Sunday night, after leaving viewers dangling on the cliffhangers presented by the Season Four finale, Mad Men returned after some 17 months to give diehard fans the sort of 1960s drama they’ve come to drool over since the show’s launch in 2007. And clearly, there are more of these fans these days. It turns out the year-plus off the air while creator Matthew Weiner wrangled with AMC only added to the Mad Men fan base, which has purchased upward of $100 million in DVDs and downloads of the show. Sunday’s two-hour season debut scored 3.5 million viewers, who found the gang in May of 1966 with questions of racial inequality blooming, the cultural revolution in full swing and Don Draper having just turned 40. All told, though, Ann Ciasullo thinks Mad Men has done about as well as it could to strip the era of its nostalgia while still being affectionate toward its characters. She points specifically to the way music — jangly, saccharine pop tunes of the era — are juxtaposed against moments of crisis or absurdity, as when Bobby Helm’s hopelessly sentimental “My Special Angel” plays while Betty Draper (Don’s wife at the time) takes a shotgun and, cigarette dangling from mouth, kills her neighbor’s pigeons. Back at Idaho, Colleen Kulesza, the doctoral candidate, says some of her friends don’t like watching TV or movies with her. She’s always picking them apart. Heather Gasser says her friends sometimes say, “Can’t you just watch it?” Jessica Maucione laughs at the truth of this. Maybe critics are spending too much time fretting over a show that, while beautifully shot and smarter than most, is ultimately still light, Sunday-evening entertainment. Kulesza considers the argument but doesn’t buy it. We are what we consume, she says. The things we are exposed to change us. And for a show that commands America’s attention the way Mad Men does, the jokes it tells, the things it lauds, matter more than most.